Writing is a creative process. Creating a valuable work needs your attention, time and everything that you can offer with no assurance of getting out in the world would make a difference as you thought it would. But that shouldn’t stop a creative person. Getting stuck is normal. We all get stuck at some point in our lives. But what makes a difference is what we do when we are stuck. Easy way – Lye around. Leave it. Accept it. Wait for something to happen – A Miracle. Hard way – Make your way up. Go through it. Go around it. Push yourself beyond reach and boundaries. Get up, play with your cards, start with what you have in your hands maybe your worse cards can turn out be an ace for you. You never know! But for that, you need to start. Somewhere. Anywhere. But Start. Fortunately or unfortunately, in life, we don’t have a start or push to start button. All you have a fire within and you have to be vigilant about getting extinguished. 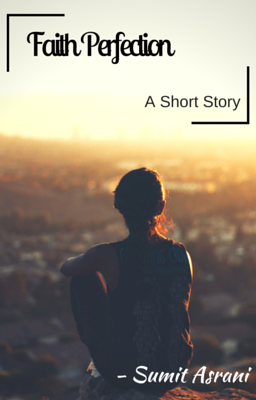 So I started with my work Faith Perfection – A short story. Faith Perfection is a short story about a mother trying to save her son against all odds. Her son won’t be able to live longer than two years. But she wants to make sure he does. And not only that, she wants him to be a Great Man instead of just an another man. Will she be able to overcome? Would be happy to see your views in comments or even better write a review on Amazon Kindle. Join the conversation by sharing your valuable thoughts. Hey, I'm Sumit Asrani. I write about Creativism—the path to creativity, the way of creative people, craftsmanship, and how to reinvent yourself to create better. Join me on this journey to become the creative bee. Here I share my journey and experiences with you - Get Blog Updates in your inbox. Get a Creative Nudge with every post.